Libya’s Devil in Female Form. Gaddafi has surrounded himself with many women over the years. His first wife had the sense to get away after six months, but Safiya Gaddafi has stood by her man and bore him eight children: Aisha the sole daughter and her gang of Â seven brothers.Â Safiya stays out of the limelight and rumor has it she is in Vienna. His Amazon Guard, seen by his side for years, have now disappeared – at least from the public eye. His little band of blond nurses from the Ukraine have also left him. But one of his staunchest supporters known as Huda the Executioner has been a loyal supporter since the early 80’s and was recently seen standing by his side In Tripoli at one of his rambling speeches – an overweight middle-aged woman in camouflage fatigues pounding the air with her fists. 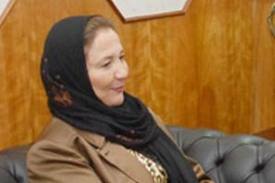 Huda Ben Amir, mayor of Benghazi until Free Libya took over, caught Gaddafi’s attention in 1984 at his first public execution of a political opponent. Gaddafi gathered thousands of school children and students in Benghazi’s basketball stadium for the hanging of Sadek Hamed Al-Shuwehdy, 30, who had returned from university in the States and quietly campaigned for an end to Gaddafi’s brutal reign. When the crowd saw the gallows and Al-Shuwehdy on his knees weeping, children cried out “No! No!” This Colisseum-style execution was televised on Libyan State TV. Â Before the eyes of all Libya and most relevant, before the eyes of Muammar Gaddafi watching from Tripoli, a young woman ran forward and dragged on the kicking feet of dying Al-Shuwehdy until he was still. Gaddafi recognized talent when he saw it and quickly promoted this Huda the executioner in his regime. Leading member of Gaddafi’s Legan Thwria (one of Gaddafi’s famed revolutionary committees), Huda Ben Amir was twice mayor of Benghazi, a favorite of Gaddafi’s and one of the richest, most powerful – and hated – women in Libya. Married with two children, she enjoyed all the privileges of Gaddafi’s inner elite: beautiful homes, luxurious cars, foreign travel – all paid for by skimming the wealth of her nation. The women of Gaddafi suffered none of the deprivation of his people. His wife Safiya and daughter Aisha are infamous for elaborate shopping sprees throughout Europe. to Judith Shipstad, ur not libyan u know nothing about it so shut the f##k up, shame on u!! Anti-Gadhafi propaganda. As if more were needed.